NASA's Aqua satellite provided a view of Tropical Cyclone Veronica after it developed off the northern coast of Western Australia. On March 20, 2019 the Moderate Resolution Imaging Spectroradiometer or MODIS instrument aboard NASA's Aqua satellite captured a visible image of the storm that revealed bands of thunderstorms spiraling into the center of circulation. The Joint Typhoon Warning Center noted that the system continued to consolidate as rain bands wrapped tighter toward a pinhole formative eye. When Aqua passed over Veronica, the storm's southeastern quadrant was brushing the Dampier Peninsula. That peninsula is located north of Broome and Roebuck Bay in Western Australia and bordered by the Indian Ocean to the west and north and King Sound to the east. Although there are not yet any warnings in place, the Australian Bureau of Meteorology or ABM has posted a watch area from Pardoo to Mardie, including Port Hedland and Karratha, Western Australia. A Blue Alert is in effect for people in or near communities between Mardie and Pardoo, including Port Hedland, South Hedland, Wickham, Roebourne, Point Samson, Karratha and Dampier. ABM recommends those residents to prepare for cyclonic weather and organize an emergency kit including first aid kit, torch, portable radio, spare batteries, food and water. 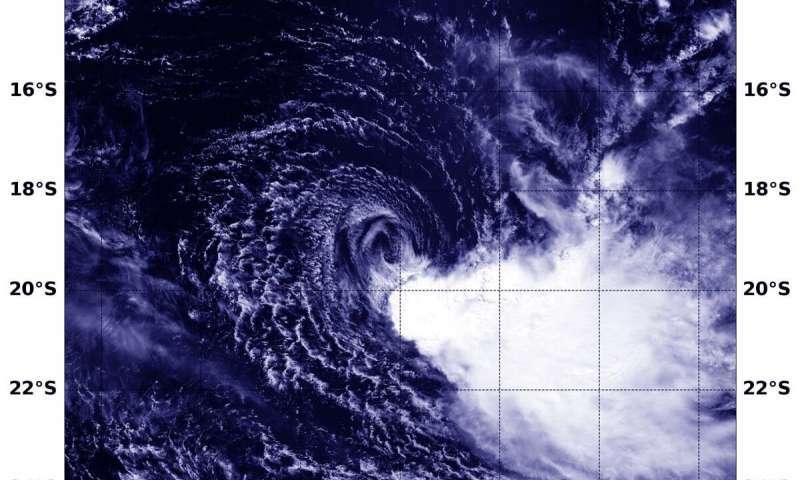 At 8:47 a.m. EDT (8:47 p.m. AWST Australia local time) on March 20, 2019, maximum sustained winds near Veronica's center were near 75 miles (120 kilometers) per hour, making it a Category 1 hurricane on the Saffir-Simpson Hurricane Wind Scale. Trevor was centered near 15.8 degrees south latitude and 118.0 degrees east longitude. That's about 314 miles (505 kilometers) north of Port Hedland. ABM noted "The cyclone is expected to continue tracking west southwest tonight and during Thursday, March 21. On Friday, March 22, the system will intensify further as it adopts a more southerly track, towards the Pilbara coast." ABM forecasts that Veronica will turn to the south and head toward Karratha by March 23. Residents along the Pilbara coast should prepare for Veronica.